Another DVD that delivers on its promise - all 171 goals of the 1998 FIFA World Cup. Price: $20 including shipping - although if you have a region free DVD player you can get it for much cheaper. Region 4 and 'All Regions' versions of this DVD are hard to find. Region 2 appears to be quite common. Bit pricey for a DVD less than one hour long. 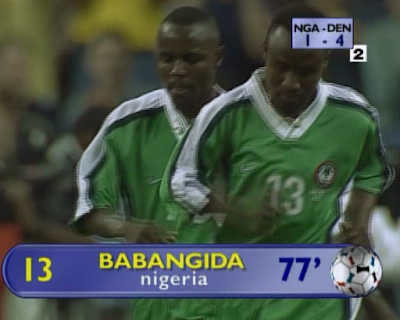 All the Goals of World Cup '98 attempts to show 171 goals in 52 minutes. That is obviously quite ambitious!!!! 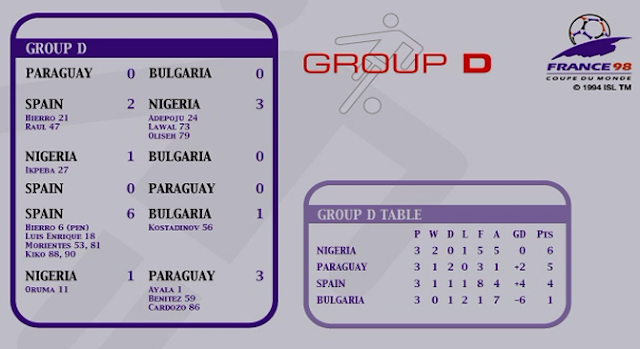 Although I did not count all the goals as I watched this, the DVD did seem to show all the goals from each match by group stage and then by the knockout stages. It follows that 0-0 draws and penalty shootouts are NOT included, although I question the latter decision as the 2006 edition of the All Goals DVD includes penalty shootouts. As you might expect, cramming so much content into such a short space of time would undoubtedly result in a compromised experience. For example, I can't recall ANY footage in the leadup to any penalty goal being awarded. Penalties are shown only from the moment the penalty is taken. No context as to what happened prior to the penalty being taken is provided. This is one significant downside to the DVD. This guy features a lot. It's not just penalties though - even goals in open play are somewhat lacking in context, as, with the exception of the better goals, the DVD only shows one or two moments/passes before the goal itself. The transition between each match is also somewhat hurried, and does not give the viewer a chance to settle or understand what is going on or who is playing (unless one hurries to look at the top right hand corner to see the initials of the teams in the scoreline). One other issue: To some extent, as with any "All the Goals" DVD, it is a bit of an anticlimax knowing that what you are looking at will result in a goal. Part of the excitement in football is wondering whether a shot will end up at the back of the net. Knowing that someone will succeed, in my opinion, takes a bit away from the excitement of the viewing. That is why I prefer "All the Highlights" DVDs - assuming such highlights include all the goals of course. Close misses are just as important as goals, I think. Picture quality on this DVD is also not the best by today's standards, but quite good I suppose given that time period. Nonetheless this DVD does a good job of compiling all the goals into one disc and has much to offer. Austria specialising in last-minute scoring: In this tournament they scored 1 late goal (all in injury time I think...or at least from the 90 minute mark onwards) in each of 3 different matches. The prowess of Denmark, especially taking it to the Brazilians. 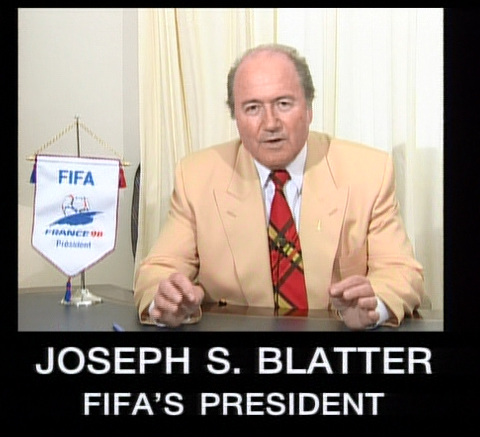 Iran beating the USA 2-1, somewhat interesting given the political climate of the 90's. Three penalties in the exotic South Africa v Saudi Arabia match. 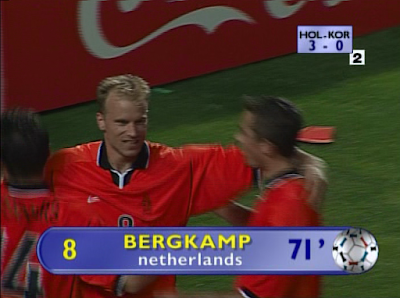 Beckham scoring only his first goal at a World Cup. Zidane attacks with a header. Holland making it again to to business end of the tournament...and failing. Apart from the problems mentioned above the presentation and the commentary is somewhat good. All goalscorers are named, along with the minute they scored. The scoreline is shown on the top right-hand. Although that being said, I do recall a moment where the commentator said "A dramatic last minute equaliser for Davids!!" when it was actually the winning goal. Who is this guy again? He offers a brief introduction to the DVD. 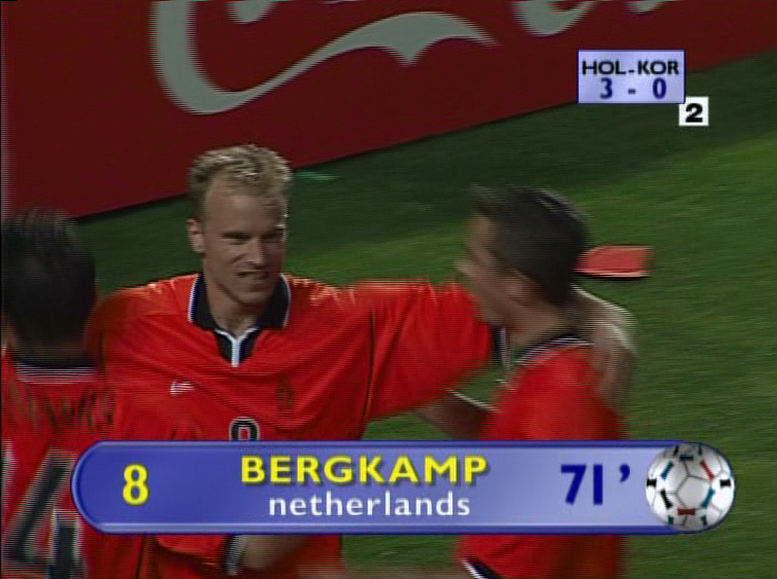 "Long ball from Frank de Boer...seeking out Dennis Bergkamp...."
Michael Owen in the middle of a crazy run against Argentina. I think this DVD does the bare minimum expected of an "All Goals" DVD. I give full credit to the producers for fitting everything in so efficiently in less than an hour. However, the drawbacks of having reduced footage cannot be ignored. The DVD could be at least 1.5x longer if more of the leadup to each goal was shown. Nonetheless this is a decently good DVD and worthy of any football fan's viewing.